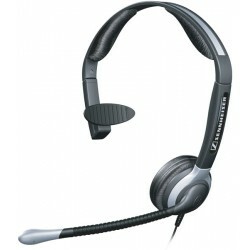 The Sennheiser SH330 is a noise cancelling corded headset. It is designed to be used with your desk phone, smart phone, or computer (each of which requires the correct connector cable).. The SH330 is an over the head wearing style, which can be worn on either left or right side by rotating the microphone.It comes with an XL earcup that measures 51mm. 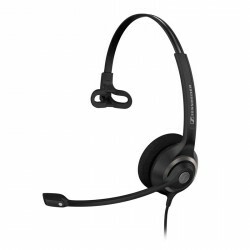 All corded headsets come with a brand specific QD (quick disconnect) connection and require a same brand adapter cable to make them compatible with your phone. These range in price from $26 upwards. Many of these cables look the same but are different inside, so if you’re not 100% sure which you need, give us a call and our staff will gladly check for you. The Sennheiser SH 330 comes with both leatherette and foam ear cushions (which saves you buying a spare) as well as a clothing clip and protective carry bag which is great for hot-deskers. It has a lightweight fully adjustable headband. The noise cancelling microphone prevents any unwanted noise being heard by your callers, while the flexible boom ensures perfect positioning. The narrowband microphone delivers a little more volume than the now more common wideband mics. The patented Activeguard technology in the SH 330 headset protects the user’s hearing from sudden loud noises which can cause acoustic shock. The headset of course comes with the peace of mind of a 2 year manufacturer’s warranty. Sennheiser’s years of expertise & experience in high end professional audio has been ploughed into their headsets and has created the new benchmark in headsets. The SH330 isn’t a wideband headset but does come in a wideband (IP) version if you’re looking to use it for VOIP. If you’re thinning on top or have very fine or short hair the thin metal headband may not be the most comfortable option for you. Other than that, the negatives of the Sennheiser SH 330 are really just generic corded headset issues; You are tethered to your phone via a cable, this can be frustrating when wires lie across your desk and get in the way of papers or drop down and get crushed & tangled under chair wheels. If you don’t have a headset port on your phone, a corded headset will take the place of your handset. If you still want to use the handset you can pick up a switch to allow you to swap between the two. As we’ve mentioned, corded headsets need connector cables, so don’t forget to factor in those costs when budgeting. If you have a phone that is difficult to match for compatibility you may have to look at an amplifier. An amp, while providing superior call control (with mute and volume controls) and sound quality, will push up the price to about the same as a wireless headset (which have an amp built in), no brainer – if you need an amp, get a wireless headset! 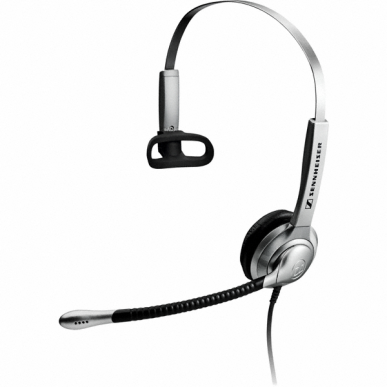 The Sennheiser SH330 corded headset is a stylish high quality solution for users that need to communicate with colleagues around them in between calls. 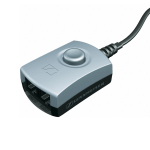 If you’re looking for the wideband version (if you have VOIP) check out the Sennheiser SH 330 IP . For users that are on calls for extended periods of time, or have a particularly noisy workplace the Sennheiser SH 350 or SC 260 may be a better option to increase call concentration. If staff sit close together and it’s really noisy the ultra noise cancelling of the Sennheiser CC510 or Sennheiser CC520 is definitely worth the extra investment. If you’re not yet brand loyal to Sennheiser, the Plantronics HW291N is an executive styled option. For those with older or less common phones, the Jabra range offers a smart cable which will provide a compatibility solution for the majority of phones. 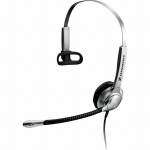 Have a look at the Jabra GN2000NCM for a robust, quality solution. Another factor to consider is the extra productivity that can be gained from the freedom to walk away from your desk while on a call. It is worth checking out the Jabra Pro 920 which is a great entry level wireless option for only a small amount extra. If you’re already in love with Sennheiser then the DW Pro 1 is an executive favourite. It is the stylish and highquality solution for users who value great comfort and top speech quality in any professional situation. The SH 330 is a sleek, single-sided headset with a stylish light-gray metal headband that’s adjustable on both sides for maximum comfort. Your customers will never have to strain to hear you: a noise-canceling microphone keeps your voice clear of intrusive background noise. And you’ll feel safe talking for long stretches on the phone knowing that ActiveGard™* technology is protecting your ears from acoustic shock. All in all, the SH 330 is a safe and easy-to-use choice for the busy professional. 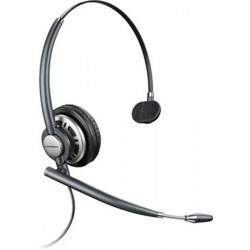 Great quality headset used by all of our reception staff. Very happy with have bought several of these. 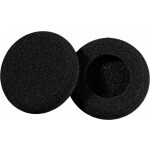 Sennheisers sound quality is great includes a screen hook case and alternative ear cups (foam and leather). My secretary managed this efficiently without my assistance. Much better than the previous headset and my secretary is now happy.